← Sources: Choosing a displacement. this is part five in the ‘new sources’ series. Now lets move to looking at the Groups individually. The first one in the conversion manual is Group 1000, the Crankshaft group. While it is discussed in great detail in the Manual, the focus here is on where do you have it processed if you want to make progress on your engine? This question has one simple answer: You have your crankshaft processed by the Weseman’s ( https://flywithspa.com/corvair/ ) or you buy one of their new USA made Billet Cranks. The have processed exchange cranks on the shelf, and you can begin your engine build this week, not next year. Above is a close up of a Gen II Weseman bearing journal on a re worked GM crank. The Gen II arrangement comes already installed on the crank, match ground in place. This is the correct choice for progress. After torqueing the case halves, the housing installation is a simple matter. It isn’t a speed contest, but I have personally done them in under an hour. First time builders at Colleges do them in 3 hours all the time. The Weseman’s have a simple loaner tool kit available, and I have my own I bring to Colleges. Buying these parts, and putting them together with your own hands is what the core of the Corvair movement is about. This is a far better option for progress than sending your case off to an alternative 5th bearing with a multi-year waiting list. Deciding to work with the Wesemans for your crankshaft is a natural. They are serious enough to have carefully developed a very detailed process, and now send cranks through it a dozen and a half at a time. I was impressed enough with their methods that I took the crankshaft out of my own personal 3,000 cc engine and replaced it with another GM crank that went through their process, simply because The Wesemans processing involves an extra step of stress relieving the crank before working on it, and this is an undeniable improvement over previous methods. They are the only people working on Corvair cranks who do this. The Wesemans process Gen II bearings for the same cranks, so you can make one call to them and send in your core crank for an off the shelf process exchange crank, that already has a specific, serial numbered, 5th bearing that has been matched to that crank. It is one stop shopping, with very little wait. Having these two elements will cover both Group 1000 and Group 3000 in your build. This is the smart choice if you want to make progress. You can review their website in detail, or contact them to review pricing and options. They also have Billet cranks, and they are evaluating the stroker Billet crank which is at the heart of their 3.3 liter motor project. 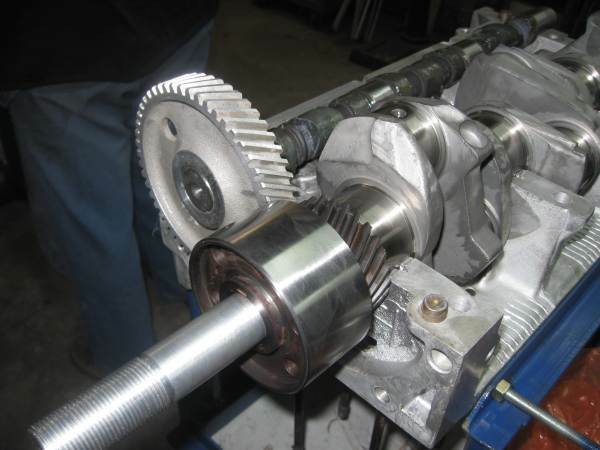 While the Billet cranks are very fine pieces of machinery, about 90% of the engines going together at Colleges are Gen II Weseman bearings that have exchange GM cranks that were processed by the Wesemans. Read the background on their site, either one is an excellent choice. Just to head off any suggestion of this from people who compulsively assume that every suggestion they read is a paid endorsement, I will state for the record that I pay full price when buying cranks and bearings from the Wesemans, including paying Florida sales tax, which means I actually pay more for the stuff than builders living in the other 49 states. If this is someone’s idea of a clever monetized endorsement strategy, they need a new conspiracy theory. I recommend these parts simply because they work, they are available, they are a good value, and they serve builders goals. It is that simple. In the long run, all of those things also serve the reputation of my work making the Corvair a viable American made option for homebuilders.